SpaceX plans to launch the first astronauts from American soil since 2011. 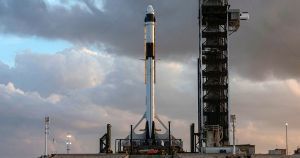 SpaceX just completed a test fire of the Falcon 9 rocket that will hopefully launch the space company’s futuristic Crew Dragon spacecraft into space. If all goes well — SpaceX still has a number of tests planned — it could be the first time astronauts launch into space from American soil since the Space Shuttle’s last trip back in 2011. The rocket in question stood proud at Launch Pad 39A at NASA’s Kennedy Space Center in Cape Canaveral yesterday. All nine first-stage engines were briefly ignited. In a joyous and emoji-laden tweet, SpaceX CEO Elon Musk promised that the first astronauts could be going to the International Space Station as soon as this summer — that is, if February’s test flight goes according to plan. It’s an important first step, and if the 21 successful Falcon 9 launches in 2018 alone are anything to go by, chances are pretty good that SpaceX can pull this off. Rather than only carrying cargo and scientific experiments aboard an otherwise empty Dragon spacecraft, human lives are at stake this time around. SpaceX plans to run an in-flight abort test before it allows any astronauts inside the Crew Dragon. Elon Musk Says An Upcoming Tesla Roadster Will Hover. Is He Joking?